My first trip to Japan and it’s been a wonderful experience. I have seen some really special Koi and even bought some myself. We have been visiting the Koi breeders of Japan since 1992. We are more experienced than most who visit Japan. Tim Waddington has been visiting Japan for over 25 years now and has taken hundreds of guests around the Yamakoshi Mountains. Tim has supplied Grand Champions all over the world which he has sourced from Japan, the relationship he has with the breeders is excellent. Tim has judged Koi shows with the breeders in Japan too. 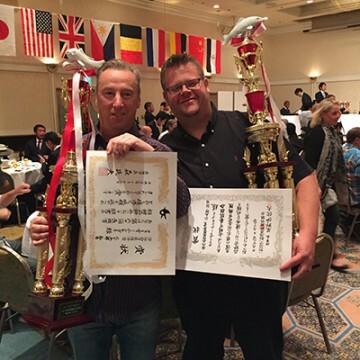 Together with Paul Birchall who has been an avid Koi Keeper for 20 years and has visited Japan many times himself, you will always be in safe hands. Visiting Japan is a must for all serious Koi keepers, the knowledge you can get in such a short time is massive. You will get to interact with the best breeders in Niigata and see how it all works at the home of Nishikigoi. We will arrange you flights through our flight partners who will find the very best prices. We fly from central Europe so we can meet up no matter where you are from. Full instructions can be given to our American clients. We try our best to have someone with you at the start of your Koi trip, someone who will make it easy getting to Niigata when you land in Japan. We will arrange the train passes for when you get to Japan and you will get to experience the wonderful bullet train. If we cannot join you on the flight we will have someone waiting for you when you arrive in Tokyo. We base ourselves in a City called Nagaoka. This is the second largest City in Niigata prefecture and is very close to the Koi breeders. A very scenic 15minute drive will take you to the heart of the Yamakoshi mountains.